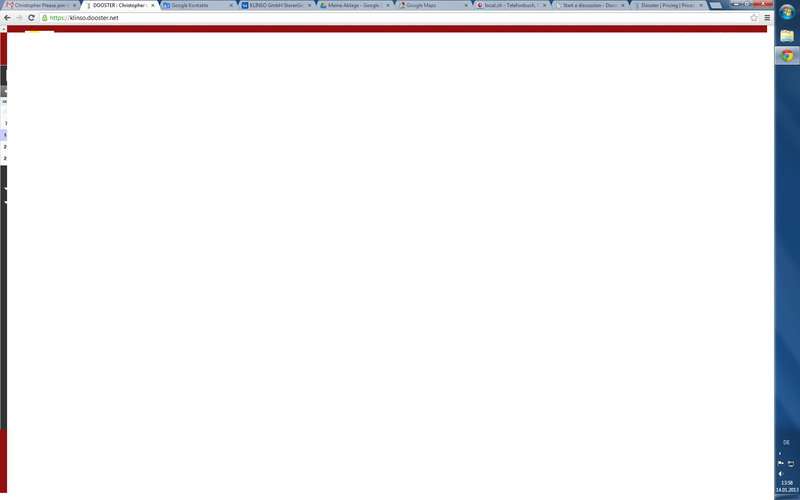 wehen we go from google apps in HE SEE my Site than dooster tells he cant see it and everthing is blanc!!! (or do i need to pay for those? in prices you told, Unlimited users!!! whan? You mean ONE ? also what is your accunt address? thanks for your mail (was in spam). We are a small copany and i got your dooster and glad to have it. We work with google apps for business about 4 years. so not all my projekts only per person one tasklist. the share one tasklist with them? I looking forward and thanks for your help john. Do you now if there is some in Pipeline at work? beacause im faszinetet, and glad to have it. I hope it is stable and secure so my gladness will go on. On the way can i make a copy in case of crash, so i have my notes and task? can you try it again and let me know if it doesn't work? it is better now but still are many qustions open? do i wrtite it again? or is my english worse that we cant read? or should be inactive that nothing happens! answer about all open question, THANKS A LOT FOR HELP. when [email blocked] will click the logo (picture) in top left, then it will again a blank screen. Hmmm That soudns odd. can we have this users email / username and passweord so we can look at this directly? AGAIN, everey inactive button, link icon app etc should not be in the Radar or should be inactive that nothing happens! OK which buttons would you like to be hidden? And not error or white screen, that we must login and out again or delete the cache!!! OK i thiought this was fixed no?